Everyone knows video race nights as a relatively low cost way for raising much needed funds for a worthy cause. As a fundraising idea - most schools, sporting clubs, charities and organisations have at least annual race events. They are easy to organise, fun to be apart of and well supported - bringing people together for a common cause. 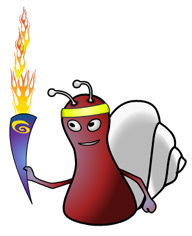 Our themed snail race night packages offer superb value for any type of quick fundraising occasion – fun, laughter and entertainment means more funds raised for your good cause. Whether it be running in the London Marathon, entering the 3 Peaks Challenge or organising an out of season rugby tour - a video race night with snails is a great choice for helping to achieve your goals. With many options to personalise the races and promote sponsors or supporting companies – our race night packs offer an alternative way of grabbing your audiences attention and keep them dipping into their pockets ! Combined with money raised through sponsorship and bar sales - it would only take in the region of £5 worth of race ticket sales per guest for the evening - for an event to be a success.